STRAP IN AND HOLD TIGHT. Dinosaur Island is about to get radically wilder. You’re holding the key to unlocking the latest, most thrilling exhibits in dino park history. Enter the land of TOTALLY LIQUID and discover… a fifth player module! Unique park facilities that give each player a different way to score points, with the help of their very own executive! blueprints that award bonus points to tidy park owners! All new PR events, plot twists, specialists, and lots of new, bodacious, slippery-when-wet marine creatures! Don’t miss out on the hottest, wettest ride of the modern Mesozoic era. The TOTALLY LIQUID park expansion is now open for business! All new Water Dino recipes! Blueprint modules increase the importance of park layout! Executive Workers give each player unique abilities! Second Island facility creates variable player powers! 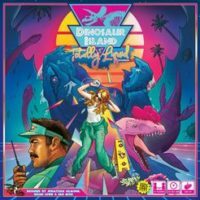 Add a Review for "Dinosaur Island: Totally Liquid"